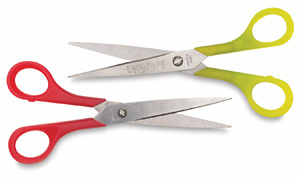 Colorful Armada Lollypop Scissors are fun for kids to use! They come in a variety of bright colors and work well for both right-handed and left-handed children. The hardened stainless steel blades have a 3" cut and are backed by a manufacturer's lifetime warranty. These scissors come in a random assortment of colors (please allow us to choose).